Having problems with charting in WebIntelligence or Crystal Reports? 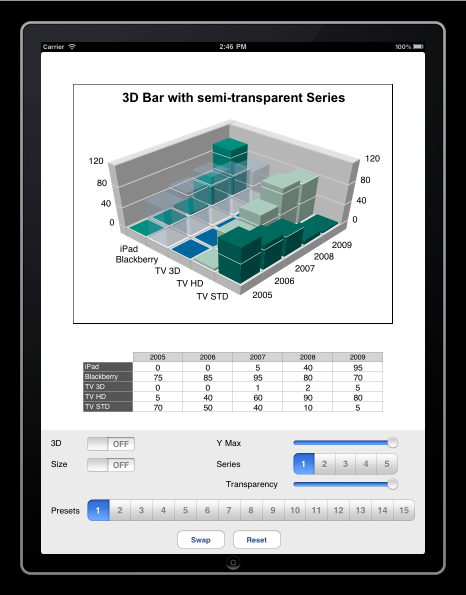 Introducing iOS:Chart, the premier chart & graph library for iOS and Mac OS X developers. Fully native Objective-C library for direct, easy use in any iOS XCode project. Serveral samples and demo projects to make integration and getting started a snap. Over 50 powerful graph types, including bar, line, area, pie, scatter, bubble and waterfall. An easy-to-use yet powerful object oriented API gives you full control over your charts with a minimum of effort. Real 3D graphs with controls to zoom, pan, rotate and skew! Adjust and control every element on every chart. Multiple Y-axis, depth effects, reference lines, scale controls and much more. The full power of the PGSDK (charting library of choice for MicroStrategy, IBM/Cognos and many more) now for your mobile application! Don't see a feature you need? Our team of chart developers stands ready to assists your organization in reaching its visualization / graphing goals! Contact us for a custom quote. To place an order, or to discuss your requirements - including any customization, call us at (310) 231-3330 x307 or e-mail us at info@threedgraphics.com.